Housed in a somewhat unremarkable building in Paris’ 11th arrondissement, Clown Bar is the former staff dining room of the Cirque D’Hiver- the winter circus next door, built in 1852. 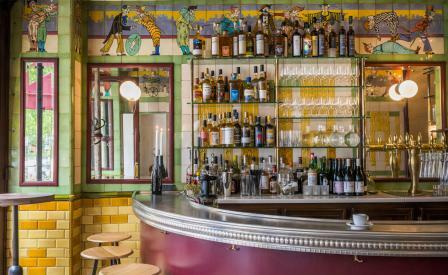 The latest project from Sven Chartier and Ewen Lemoigne, the duo behind the much-acclaimed Saturne Restaurant, the new offering has emerged after months of restoration work to feature colourful hand-painted glass ceilings and enamel tiles depicting circus scenes, skilfully composed by scenographer Sandrine Place. Chef Sota Atsumi oversees the kitchen with a tapas-meets-izakaya style menu, serving up dishes such as fresh green beans topped with goat’s cheese and strawberries. Favourites include raw bonito fish with horseradish and langoustines served with white asparagus and yuzu paste. The sun-drenched terrace, meanwhile, makes it the perfect place to enjoy some nibbles and a drink from the small but perfectly curated wine list.